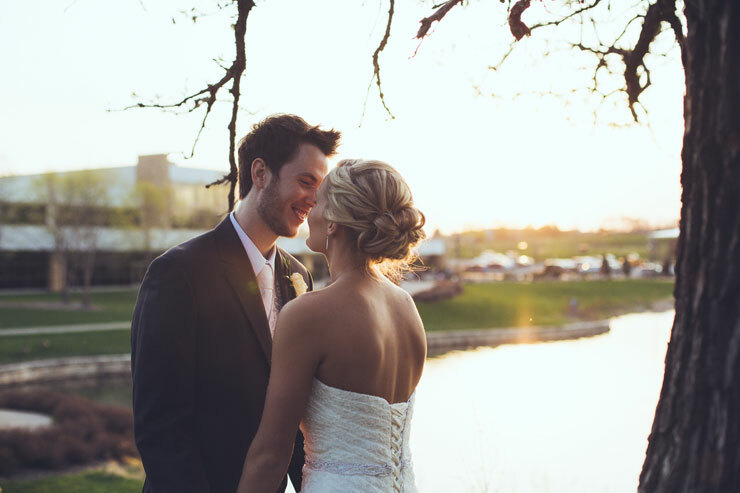 Natalie and Kyle had a sweet arrangement when it came to sharing wedding planning tasks. Read along as Natalie shares how they tackled their "to-do" list and what parts Kyle truly cared about and had fun with. Be inspired! Not very equally. Kyle was working 12 hour days, and I had much more free time than him. Early on in the process we agreed that it made much more sense for me to do the majority of planning (this worked out well because I was more excited about the planning portion than he was). I asked Kyle how much he wanted to be involved and what things he had opinions on. There were only a few things he had opinions on: invitations, photographer, DJ, groomsmen attire, and food. With everything else, he gave me the go ahead to make decisions. This was a helpful conversation because I knew what tasks we needed to do together and which tasks I could get done on my own time without pestering him about all the little details….because there are a lot! As much as I tried to convince him that his opinions mattered to me, I think he kind of assumed that whatever the bride wants, goes. He seemed to be fine with that and I was excited about planning, so I guess it worked out! I made sure to consult him on everything he had opinions on, but otherwise I just made decisions. Kyle had a connection with the photographer, so he helped get the ball rolling on that. He also had connections with the piano player and the pastor. He was the one who initially communicated with these people--which was very helpful! He also communicated with the DJ company. Since the dance was more important to Kyle than it was to me, we agreed he should take care of the DJ to ensure that he got what he wanted. Might sound a little cliché, but communicate! It’s good practice for marriage! Kyle and I had a bunch of conversations regarding who needed to do what, and what I could do without consulting him. Planning goes a lot smoother when you are both on the same page. I also communicated with Kyle when I was overwhelmed with decisions. Even if it was regarding a detail he didn’t really care about, he did his best to care and help me make decisions. As ideal as it would be to have each person equally involved in the planning process and equally excited, don’t set your expectations too high. Reality is, one person is probably going to be more excited about the planning. Don’t be discouraged if your fiance doesn’t seem to have an opinion about something. Just because they might not want to be as involved in the planning as you’d like; it doesn’t mean they are not excited to get married to you. Offer to help, especially when your fiance seems overwhelmed. Ask about the details even if you might not care. Kyle always had a listening ear, even when it was in regards to details he didn’t know existed! Just knowing he would listen was helpful for me. I was also blessed with an amazing mom and mother-in-law who helped me plan. I couldn’t have done it without them. Since Kyle didn’t have as much time to commit to planning as I did, I got to spend a lot of special time with my mom and mother-in-law. It was awesome bonding time. Find a few special people to help you out when your fiance can’t be there. What great incite! Nothing matters more after the wedding then communication. So starting that process while planning the wedding makes sense. Thanks for sharing. Thanks Rae! We couldn't agree more--communication is key!